In this webinar Dave Seidman, head of the elctronics division for Riverfront Yacht Sales & Services in Cleveland, Ohio, explains the different types of batteries available and the pros and cons of each. You will learn how to maintain and monitor your batteries. You will see how to put together a proper house battery bank and how to keep it separate from your engine start battery. You will learn how to charge those battery banks back up, using a high output alternator, Smart 110V chargers, and inverter/chargers. In this webinar Dave will also cover how to use solar panels and wind generators as alternative charging sources. 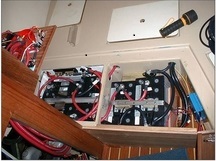 Don't miss Managing Your Boat's Electrical Appetite --- Batteries, Electrical Usage and More Click here to register for the recording.